The name Fred G. Beers is recognized by most residents in and around Perry, Oklahoma, from his lifetime of community service and his historical writings about the community. Much of what we know about the early years we learned from his books and "Northwest Corner" columns in the Perry Daily Journal. Especially through his columns, Fred paints for us a Norman Rockwell type picture of growing up with community ties and a sense of extended family that only a small town can provide. We mourn his passing on August 6, 2007 at the age of 82. The last Northwest Corner was written by Charles Hall as a tribute to Fred G. Beers. 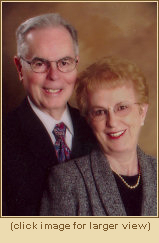 Pictured here with his wife, Laura, Fred received many honors for his work, including the designation of "Honorable Historical Laureate" in 1997 by the Noble County Chapter of the Cherokee Strip Historical Society. In this online exhibit we would like to honor Fred Beers by preserving his "Northwest Corner" newspaper columns in a format that is easily accessible and searchable. Historical researchers and genealogists for years to come will have the benefit of the history contained in over 1,300 Northwest Corner articles and knowing "what Fred had to say." The "Northwest Corner" columns contained in this tribute have been reprinted with the permission of Fred G. Beers and the "Perry Daily Journal," Perry, Oklahoma. Special thanks to Cheryl DeJager for compiling these articles into a digital format. Not all of the historical information and photographs contained in this exhibit are available at the Cherokee Strip Museum. Photographs may have been edited for presentation on the web site. Material presented is the opinion of the respective author and not that of the Cherokee Strip Museum, the web host, or any other entity.